Weekends are a great opportunity to take things a little slower. The mornings are long and lazy, pyjamas generally stay on much longer than they should and the coffee pot often brews for round two while the paper is distributed amongst interested parties across the dining room table. A steady influx of pancakes completes this picture quite nicely. 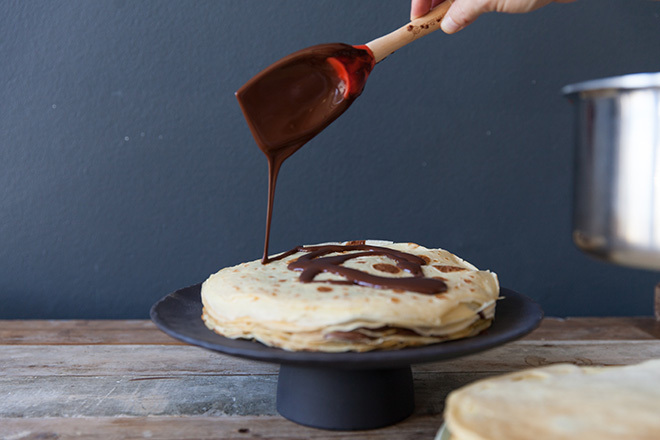 Here’s our ultimate pancake guide for when Sunday morning rolls around. The ideal thing about pancakes is that you can have them with just about any filling you feel like. Last night’s ragu? A crumble of chocolate and some fruit salad? Anything goes and it’s bound to taste incredible. A foundation recipe to get creative with. Any filing goes. Who said pancakes had to be sweet? 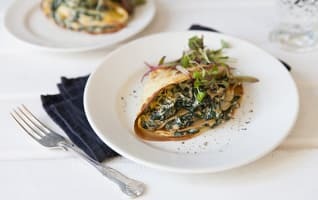 These, with a savoury filling, are a great dinner option. 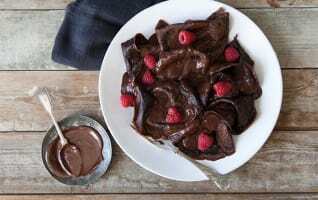 This recipe turns the pancake batter itself into pudding. Top it with berries for a heavenly spread. 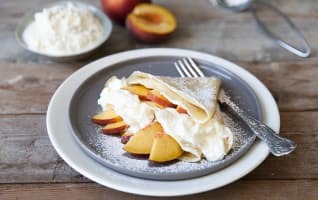 Tart peaches and rich cream turn pancakes into a decadent dessert. Share it with a pot of tea. They often say ‘don’t blame the tools’ when you’re not running at your optimal speed or your tennis swing isn’t acing like it used to. But when it comes to cooking – the right tools make all the difference. 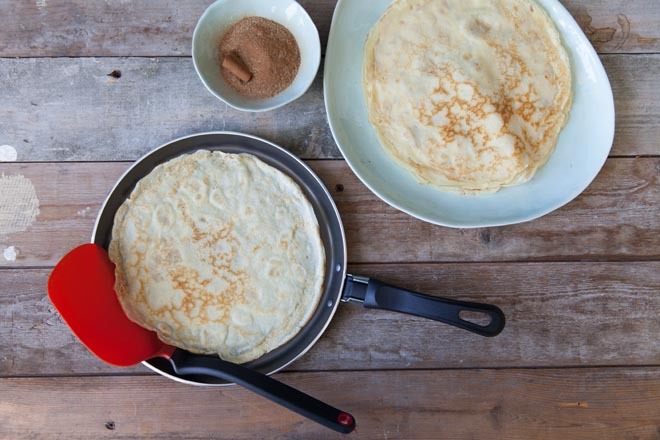 A wobbly pan with uneven heat distribution, a peeling surface and broad blistering spatulas don’t do much to inspire the pancake in you. 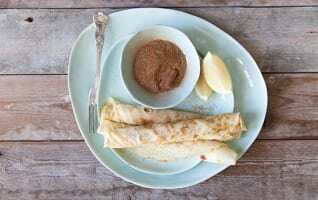 With a few simple tools and tricks of the trade for pancake making, those crêpe-like treats are just a wrist flick away. 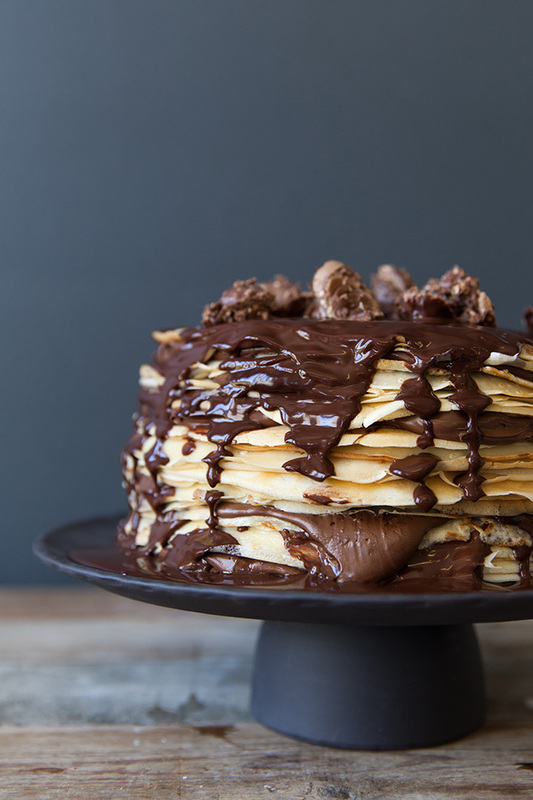 If you want to go big with your family pancake feast you could always make this decadent pancake cake. You know, since you only live once and all that jazz. Here’s to a weekend of sharing more pancakes – and fighting over the last one. It’s ok, we all do it.